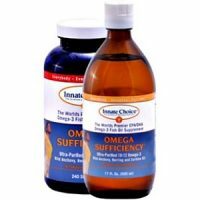 The Omega-3 supplement that is the subject of our review today comes in liquid and capsule form and is called Omega Sufficiency by Innate Choice. An Omega 3-rich diet is linked to a decreased incidence of heart disease, cancer, diabetes, obesity, high blood pressure, bad cholesterol, depression, ADHD, Alzheimer’s, arthritis and allergies. This is thanks to the EPA and DHA fatty acids found in Omega-3 rich foods. So, can you not simply consume fatty fish such as mackerel, tuna and trout to obtain your intake of DHA and EPA? The fact is that unless these seafood sources are farmed in pristine waters, they are bound to be contaminated with pollutants such as mercury. You’d also have to consume several high quality sources of these meals per day, almost to the exclusion of all else. Innate Choice clams to be the world’s premier EPA/DHA Omega 3 fish oil. The company claims to have the least toxic source of omega 3 fish oil, and says it extracts even trace amounts of pollutants and toxins through a molecular distillation process. What’s in Innate Choice Omega Sufficiency? 720-825 mg EPA – A ‘good fat’ integral to overall health and functioning. The body does not store it so it has to be replenished. 480-550 mg DHA – A fatty acid integral to good eye and brain development. Proprietary antioxidant blend of rosemary extract, ascorbyl palmitate and natural mixed tocopherols – Natural antioxidant and anti inflammatories in rosemary, mixed with vitamin C and vitamin E, which further enhance these properties. 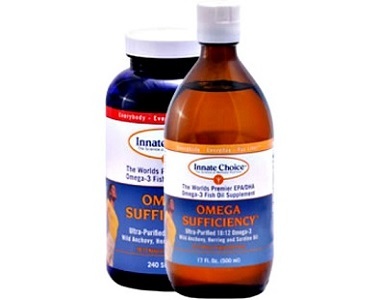 How Do You Use Omega Sufficiency? Is you buy the liquid form, shake it well before use and keep it refrigerated. Take 1/2 teaspoon or 2 capsules per 40 pounds or 18 kgs of body weight. So, if you are a 200 pound adult, take 2,5 teaspoons or 10 capsules per day. Use the same ratios for children. Not suitable for those with a fish allergy. If you’re taking blood thinners or aspirin, note that EFAs thin your blood further. Consult your doctor. A bottle of 240 capsules retails for $41 on Amazon, while a 500ml bottle of oil retails for $44. The 300 ml bottle was not in stock at the time of writing this review. You may only return unopened bottles and within the stipulated 30 day-day time frame. Therefore, the returns policy does not allow you to test the product before opening it. The manufacturer does seem to use an advanced distillation process that purifies its sources at a molecular level. It also sources its actual fish in pristine Nordic waters and the purity of this source is third-party tested. This makes the level of antioxidant properties higher, and therefore slows down cell degeneration.The disclosure around the product synthesis is transparent. The level of EPA, per serving, is quite high but bear in mind that a serving is 4 capsules. Depending on how much you weigh, you may have to take 10 or more capsules per day. You therefore need to consider the cost factor before deciding to make Omega Sufficiency your supplement regimen. This has cost implications as you could then by using a bottle in 2 or 3 weeks, making the product expensive. You can’t return open bottles, so there is no way of knowing whether this product works for you – and this is another huge factor to keep in mind as it may be a risky purchase. If you buy the product but have difficulty swallowing 8 or 10 or more capsules a day, you cannot get a refund. 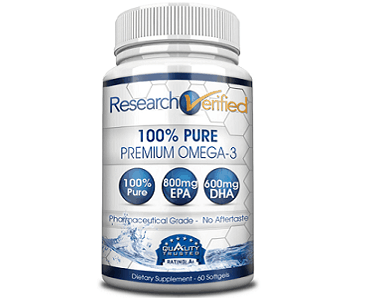 It may be best switching to a product with similar EPA and DHA levels in one capsule.